Here are the days of the week. Names of the months and how to write dates will come in a later post. Days of the week aren’t capitalized unless they’re at the beginning of a sentence. You can see that they all end in “-dagur”. This makes things easy, as all the words thus decline (change) in the same way when making sentences. Í dag er mánudagur – Today is Monday. You use the “dagur” form when að vera (“er”) is in front of the day of the week. This is because that verb “governs” nominative (dictionary) case, which just means that it forces the words it’s talking about to be in nominative. Ég ætla að læra íslensku á mánudaginn – I plan/am going to learn/study Icelandic on Monday. The “daginn” ending means that you’re only talking about one specific day or time. This is in accusative case, but don’t worry about cases if you’re not learning them yet. Note: You cannot have two conjugated verbs right next to each other. Saying “ég ætla læri íslensku” is like “I intend learn icelandic”. You have to put “að – to” in-between and change the second verb to be in infinitive form (in English we can keep the second verb the same and only need to add in “to”, but Icelandic needs the extra step). There are some other rules with this but I won’t go into them here. Ég læri íslensku á mánudögum – I study Icelandic on Mondays. The “dögum” ending means multiple days, in this case multiple Mondays. This is in dative plural. Á hverjum (…)degi – Every (…)day. This can be left alone or you can add a real day into it. Ég læri íslensku á hverjum mánudegi – I study Icelandic every Monday. This is in dative singular. 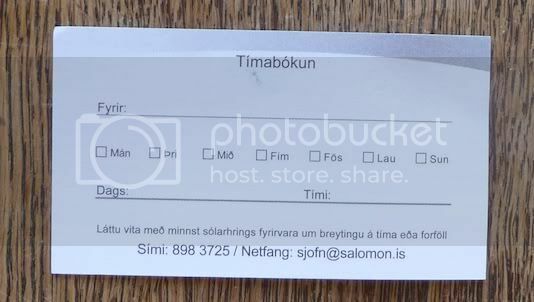 This is the backside of a business card. It has a convenient form you can fill out to remember your next appointment. This is useful information, thanks for this blog entry. I think I can now correctly know when to use dagur, daginn, and dögum. Finally! @Verónika Thanks! I’m always nervous about what I’m posting here, I usually don’t know if anyone would find it useful. I find it easier to memorize set phrases instead of trying to work on memorizing the conjugations of every single verb and noun and then trying to piece them together haphazardly. Unfortunately you have to tackle all that stuff sometime though… I used to use Byki to memorize sentences a lot but back then I didn’t study the grammar much so I was left with lots of questions all the time.